The forming of good habits continues through the high school years, leading our children to the place where they self-regulate their actions. In our home, our teens were never rebellious or contrary and I think a lot that was because we didn’t have many “rules” to live by. They were guided and corrected in a way to help them build habits that will last them a lifetime. Children with good habits are a joy to be around. Read more about habits: Building Good Habits in High School and Good Habits for Moms. Incorporate as many avenues of reading and learning as possible, using literature, biographies, speeches, and videos to help your child immerse his learning of a particular time period. High school students are capable of reading a lot of material and if you follow up your reading with some form of narration it will stick better and longer. History will come alive. Read more about my thoughts on this: Charlotte Mason Knew the Secret to Learning Relationships. There were times when it seemed like a lot of effort to add in a Shakespeare play every term but afterwards I would realize how much we all enjoyed the experience. The same was true pretty much for poetry as well. Poetry is not an easy topic to cover on your own with high school students and our tastes in poets varied greatly which added an extra element when planning. But, in the end, I look back on our Shakespeare and poetry studies with much warmth because they did add that extra “something” that made each year a little better. My boys still quote Shakespeare from time to time and I know it will be carried with them into their futures…better for having read it while they were young. Read more: Shakespeare and High School Poetry. I could talk all day about the value of continuing nature study in high school. I hold those times we were outdoors together as cherished memories. My boys have grown in their knowledge of our local plants, trees, birds, reptiles, weather, and so much more. They are comfortable outdoors and seek opportunities to spend time in nature. They appreciate the changes in the season and are skilled at following a map, planning a hike, and growing things. Dirt is not their enemy. You can read more: Nature Study for High School Students. Last but not least is the skill of narration that is emphasized in a Charlotte Mason education. Narration is never tiring for my boys and if given a choice they will write a quick summary, give an oral account, or create a follow-up project in place of a test any day. Their notebooks are filled with their individual accounts of their learning. These thoughts are their own connections with their reading and research. I can’t think of a better way to learn for my boys. You can read more: Narration in Our High School. Reflections on a Charlotte Mason High School – read more of my thoughts on high school. 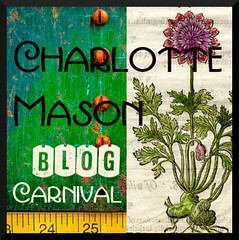 I am submitting this entry to the Charlotte Mason Blog Carnival and if you have any entries you would like to submit, you can send them to this email address: [email protected]. Barb, thank you SO MUCH for sharing your homeschooling high school journey and knowledge (especially the CM viewpoint). I have a soon-to-be middle schooler, and thanks to you, I feel like we CAN be ready for high school, that we will succeed, and we can keep learning in the way we love to learn! I have actually stopped being nervous about it and am now looking forward to it in some ways. Thank you a million times over. Erin…thanks so much for the comment and I am so very glad that I have helped you in your homeschooling journey. I love that you are not nervous about high school because it is the best of the best when it comes to homeschooling. I found that as we progressed through the years that it was a delight to see how everything can to fruition. I am so glad we stuck it out. Best of everything to you!